c) make the service configurable to adapt to your own needs. This tgz-file is not only a good backup of your work, we will also need it to create the Offline Bundle. Currently there are two different tools available to accomplish this: VMware's unsupported VIB Author tool and my ESXi5 Community Packaging Tools (ESXi5-CPT). I already blogged about how these two compare when VMware made its tool available as a so-called fling. One thing that we need to take care of when building a VIB package is choosing a suitable Acceptance Level for it. The tools that I mentioned are primarily meant for building packages of the Acceptance Level CommunitySupported. This is the lowest possible level (in terms of trustworthiness), and it is normally assigned only to packages that have not undergone any official certification process and are not supported by VMware or any other vendor. However, you can only change a very limited set of system directories with such a package (for details see this post), so it is not suitable for our purpose. All the higher Acceptance Levels (PartnerSupported, VMwareAccepted and VMwareCertified) require specific certification processes and support statements either by the software vendor or VMware itself. To provide a technical verification method these packages are electronically signed, and by default the signature is checked at install time. With a package of the Acceptance Level VMwareAccepted (short form: accepted) you can add files in arbitrary system directories, so this is for us. However, we will not be able to provide a valid electronic signature ... Luckily you can skip the signature check when installing, so this is the way that we will go with our own package. Please note: VMware does - of course - not recommend doing this, and you will render your system into an unsupported state by installing an unsigned package (for details see again this post). 1. VIB Author is shipped in RPM format. Download and install it using the package manager of your favorite Linux distribution. VMware recommends using SuSE Linux Enterprise 11 SP2, but other distributions should also work well if all dependencies (see System Requirements) are fulfilled. The payloads/ProFTPD directory contains our project files, and you can easily fill it by unpacking the tgz-file that we created for backup and preparation (see above). from within the parent directory of the project directory. The command will issue a warning that a VIB file with "accepted" acceptance level need to be signed, but will happily produce a VIB file and an Offline Bundle ZIP file for us. The information provided here is also available on the ESXi5 Community Packaging Tools project page. You will need access to a Windows system (Windows XP or newer, Windows 8 is untested). 1. Download the latest versions of my tools from the project page. They are available as a self-extracting archive: Just run it to install it. All needed tools are included, there are no special requirements or dependencies. In this GUI you also enter the package's metadata (section VIB Description Data) that will be part of the descriptor.xml file and select the Package properties that will also go in there. You can load presets for these properties, and in our case it is safe to load the presets for a firewall rule package. You only need to change the Acceptance Level from the default community to accepted. After pressing the Run! 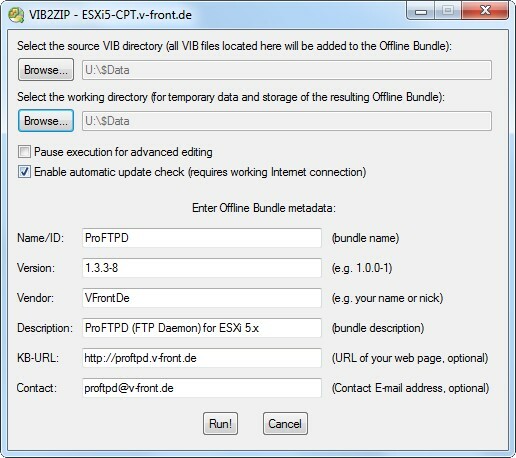 button a VIB file named ProFTPD-1.3.3-8.x86_64.vib will be created in the working directory that you selected. For the source VIB directory select the working directory that you chose with TGZ2VIB5 before and that contains the VIB file that we created (Please note: All VIB files that are stored in this directory will be added to our Offline Bundle, so make sure that this is the only one in there). Enter the same metadata that you used with TGZ2VIB5, and optionally add a KB-URL and a contact e-mail address. Then press Run! to create the Offline Bundle. It will be stored as ProFTPD-1.3.3-8-offline_bundle.zip in the working directory that you selected. Now that we have created an Offline Bundle with either the one or the other method let's install it and see how it works. in an ESXi shell (replace datastore1 with the name of your datastore). The --no-sig-check parameter is needed to skip the signature verification for our unsigned package. The installation will run fine, but if you then test the FTP access to the host you will notice that the FTP daemon is not listening and the connection times out. Why? access denied for inet_socket_bind?? It looks like the VMkernel does not allow the FTP daemon to bind to the FTP port 21! But this worked before when we executed the daemon from a datastore directory. So what is different now? The difference is that the FTP daemon is now (after having installed it) a part of the system image. And as such it is under control of the VMkernel access security system. This system is managed by the secpolicytools command and configured by the files that you find in the directory /etc/vmware/secpolicy. There is no publicly available documentation about this access control system, so everything that I was able to find out about it is based on reverse engineering (and might also be slightly or completely wrong). I believe that - by the configuration files that are stored in the above mentioned directory - security policies are defined that control what software packages (also referred to as tardisks) are granted what system permissions (like reading a file, writing a file, binding to a TCP socket, etc.). I named this file ProFTPD, but in fact its name has no relevance at all. It is only important that we make it a part of our software package! It is not enough to manually add the file after our package was installed, it needs to be made a part of and installed with our package. I think that the above mentioned line will grant every possible system permission to our package, much more than it really needs. So it is kind of a quick-and-dirty solution, but limiting the permissions to exactly what is needed would cause a great testing effort and would also require a much better understanding of the security policy definitions than I have right now. Create a tgz-file with these updated contents and a new Offline Bundle, and after installing this new Offline Bundle the FTP Daemon will work just fine! When we prepared and tested our package by manually creating the associated files in the ESXi system directories we did not have any problems with changing, overwriting or editing these files. However, once we install the files as part of our Offline Bundle we are no longer able to change them. By default all files that are part of the system image are read-only, even if we assigned w(rite) permissions to them using chmod! This is okay for the binary, init-scripts and firewall rules, because it prevents them from being accidentally overwritten or changed, but wouldn't it be fine if we could change the daemon's config file /etc/proftpd.conf after it has been installed? Obviously this must be possible in a way, because there are other ESXi configuration files stored in /etc that you can change (like /etc/hosts). I found out how to do this after reading the excellent white paper VisorFS: A Special-purpose File System for Efficient Handling of System Images that was published by VMware Labs. This is a must-read for anybody who is seriously interested in learning how the ESXi file system works (I'm not referring to VMFS here, but to VisorFS which is the file system of the ESXi system itself!). And what's even better: If such a file is located under /etc then it will be automatically saved to /bootbank/state.tgz by the script /sbin/auto-backup.sh that runs through cron every minute. And that means: The changes will persist upon reboots! So after running through another iteration of creating a tgz-file (after setting the sticky bit on etc/proftpd.conf), building the Offline Bundle and installing it we finally reached the status of the ProFTPD Offline Bundle that I recently published ... and this also ends the "Daemon's VIB" series. I hope that my findings will help you with creating your own software packages for ESXi, and I welcome any feedback! Andreas, Thanks for the 3-part series about creating a software package for ESXi. That by itself is worth a lot, but the supporting information it contains about how the permissions are managed and where what directories/files are and their function, is the real "re-inventing the wheel" time saver information.